Understated by design, deck and hardscape lighting subtly, but effectively illuminates your steps, benches and railings. 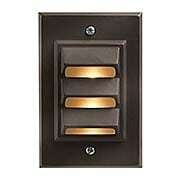 In addition to providing an attractive ambient light, deck lights add a measure of safety for your family and guests. Choose from wall or floor mounted models, and a wide variety of styles, sizes, and LED options. This square deck sconce is ideal for installing into posts or for lining the stairs of your deck for added safety and illumination. 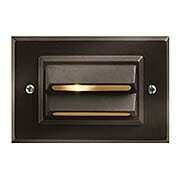 Made of weather-resistant cast aluminum, it features your choice of two durable powder-coated finishes. Comes available in both energy-efficient LED or incandescent lighting options. This vertical deck light is ideal for installing into posts, or for lining the stairs of your deck for added safety and illumination. Made of weather-resistant cast aluminum, it features a durable powder-coated finish. This energy efficient LED deck light is ideal for installing into posts, or for lining the stairs of your deck for added safety and illumination. Made of weather-resistant cast aluminum, it features a durable powder-coated finish. 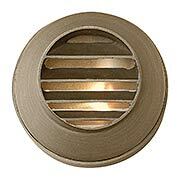 This Traditional Round Eyebrow Deck Light is ideal for installing into the posts or lining the stairs of your deck for adding safety and illumination. Made of weather-resistant cast aluminum, it comes in your choice of two powder-coat finishes. Comes available in both energy-efficient LED or incandescent lighting options. 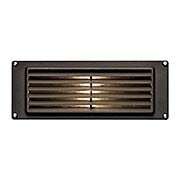 Our Traditional Louvered Brick Light is ideal for installing into masonry or wood applications for added safety and illumination. Made of weather-resistant cast aluminum, it features your choice of two durable powder-coat finishes. 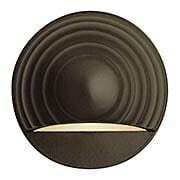 Comes available in both energy-efficient LED or incandescent lighting options. 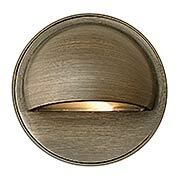 Named for the ruggedly beautiful island off of the coast of British Columbia, the Hardy Island Round Eyebrow Deck Sconce is a striking example of form and function. Designed to withstand the harshest elements, it is made of heavy-duty, solid cast brass, and features a weathered finish that ages gracefully over time into a beautiful natural patina. Ideal for installing into the posts and lining the stairs of your deck for added safety and illumination. Named for the ruggedly beautiful island off of the coast of British Columbia, the Hardy Island Round Louvered Deck Sconce is a striking example of form and function. Designed to withstand the harshest elements, it is made of heavy-duty, solid cast brass, and features a weathered finish that ages gracefully over time into a beautiful natural patina. Ideal for installing into the posts and lining the stairs of your deck for added safety and illumination.